Pride House 2012 is a project of Pride Sports UK, in collaboration with the European Gay and Lesbian Sport Federation (EGLSF), the Federation of Gay Games, GLISA International, the LGBT Consortium, and the Pride House Foundation and aims to offer a welcoming space for all athletes, staff, spectators and friends of London 2012. Pride House 2012 will be open from 3 to 7 August at CA House in Limehouse Basin on the river Thames, with the Pride House 2012 festival continuing in various venues through 12 August, the day of the closing ceremony of the Olympic Games. 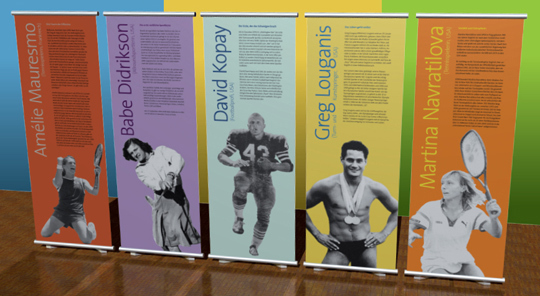 “Against the Rules” is made up of 37 panels related to homophobia and LGBT sport, including biographies of athletes like Amelie Mauresmo, Billie Jean King, David Kopay, Greg Louganis, Imke Duplitzer, Judith Arndt, Justin Fashanu and Tom Waddell. The exhibition is presented by the EGLSF with the financial support of the European Commission (DG Education and Culture) as part of the project coordinated by the European Gay and Lesbian Sport Federation on “Preventing and Fighting Homophobic Violence in Sport”. This entry was posted in againstherules, exhibition, leadpartners, pressrelease, programming by marcnaimark. Bookmark the permalink.